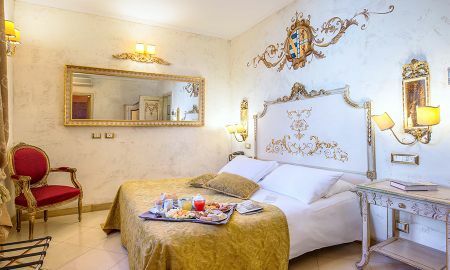 Located in an elegant and stunning building dating back the XIX century, the Hotel Veneto Palace appears as one of the most breathtaking examples of the Italian architecture of the Romantic Age, decorated with frescoes and antiques. 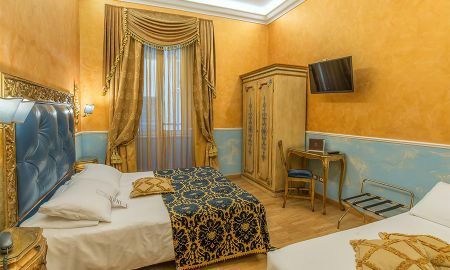 The Hotel Veneto Palace is a four-star building which was restored in 2012 to offer guests first-rate and luxury services. It is a real point of reference in Rome and also the best choice for meetings or private parties, thanks to its 24/7 open Ateliér Bar. At the reception desk, guests can book guided tours around Rome, restaurants, transfer, taxi and body treatments or buy tickets for other unmissable attractions. The staff always pays attention to customers by offering them the best facilities and information anytime. 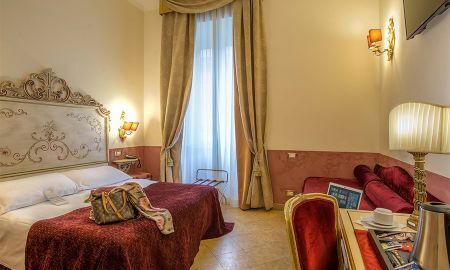 The Veneto Palace Hotel is located in the monumental and unique scenery of ancient Rome, not far from Piazza di Spagna, the Trevi Fountain and Villa Borghese, which is the largest park in central Rome.